Good Choice Reading: Dreamless by Josephine Angelini Blog Tour + Awesome giveaway! Dreamless by Josephine Angelini Blog Tour + Awesome giveaway! "No! I'm not here because of Daphne, you lunatic! I'm here because I think that what you're trying to do is amazing, and probably the most important thing any Scion has done since the Trojan War!" Ooh what a tease! The blurb looks so great and I LOVE the cover! Love the blurb! Added this to my wishlist. Great review! Seriously can't wait at this point!! Just finished re-reading Starcrossed (again!) and can't wait to download Dreamless at midnight! I can't wait for this book to come out! I still need to catch up by reading Starcrossed. They sound so good & I love the covers! The anticipation is killing me...and the teaser made it even worse! What a beautiful cover. This is a new author for me. I love to read and always looking for new books and authors to check out. Liked the blurb and the short excerpt. Thanks for the giveaway. Thanks for the giveaway! I love these covers. They are so pretty! Got the book on saturday and read it in a day! Could not put it down! Josephine Angelini did not disappoint! Dreamless sounds like a fantastic read! Sounds really good! Thanks for the awesome giveaway!! I can picture who is saying that, and it makes me extremely excited to read the book! Sounds like a good story. And I love the cover! Loved the excerpt! I can't wait to read this book!! Oh I do hope I win. I think this sounds good! I am really excited for this book!!! 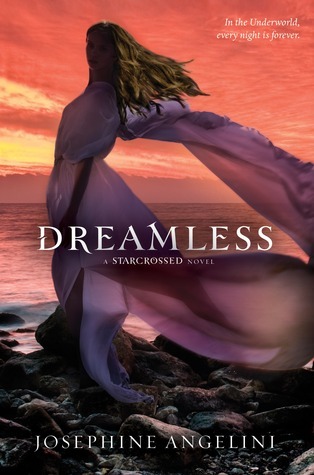 I am in the middle of Starcrossed and I am hooked I can't wait to read dreamless as well!! Just got this book, so excited to read it! Great teaser! I don't know who said that, but I seriously love the wit and snark that some of the characters have in this series. Can't wait to read Dreamless! GOING STRAIGHT TO MY TBR LIST! THE CHARACTERS ROCKED!